(BPT) - For Angela Walker, music was her first love, her passion and her whole identity. "Once a singer, always a singer," she often says. That was true even after she joined the U.S. Navy in 1985. But what happened next forever changed Walker's perspective on what it means to have a voice. When she was 26, Walker knew she had a calling to serve and protect her country and its ideals. She served as a naval airman and sang cadence in boot camp while training to work on helicopters. During boot camp, she developed a throat condition and lost her voice. When Walker was medically discharged, she was devastated. On top of that, Walker's illness worsened, and she was later admitted to a U.S. Department of Veterans Affairs (VA) hospital, where she would meet a therapist who helped change her life. "One day I met Jessie," Walker recalled. "She played the piano and would encourage patients to sing along with her. She kept at me, until I gave in and sang 'Summertime' by Ella Fitzgerald. In that moment, I found my voice again." Once Walker began singing again, it was clear she still had talent. So much so that years later, she would become a five-time finalist at the National Veterans Creative Arts Festival (NVCAF), which is open to veterans who participate in their local VA hospital's creative arts therapy programs. Veterans can submit their work in the categories of performing arts, creative writing and visual arts through their therapists for a chance to be selected for the NVCAF. Once selected, veterans from around the country join together for the weeklong event with creative workshops, an art exhibit, meet-and-greet and a live stage show to display their talents. Today, Walker volunteers at her local VA hospital to help others find their voice, in addition to traveling on tour and singing commercial jingles. Her story is not that different from many other veterans involved in art therapy programs, which help veterans recover from and cope with physical and emotional disabilities. Creative arts gives them an outlet to express themselves through various forms of art. Often, this form of therapy is the life-saving tool veterans need for rehabilitation. The NVCAF is co-presented by the VA and the American Legion Auxiliary (ALA), the world's largest women's patriotic service organization and one of the nation's most prominent advocates for veterans' needs. For 17 years, the ALA has partnered with the VA to co-present the festival to celebrate veterans and their talents. Thanks to volunteers from across the country, the ALA assists veterans with art projects and their travel to the NVCAF, assembles displays, and supports publicity, production and materials development during the weeklong event. Many of the volunteers from ALA units make it a yearly commitment to donate their time to support this program. 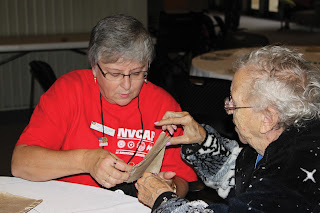 Sharon Neville helped host the NVCAF in her home state of North Carolina in 2014 and has volunteered at the event multiple times since then. "This experience is unlike any other," said Neville, who began volunteering in 2013. "This festival is life-changing for all who attend, not just the participants. It's a way for the public to understand a veteran's journey, appreciate it and celebrate it. It's a story that many of us will never know, but we should start listening." 0 Response to "Creative arts help veterans reclaim their voice "